A design assistant from Hong Kong, Esther Lui’s EcoChic Award collection was inspired by the legend of Mulan. Strong and refined, her collection garnered the attention of the judges leading her to be the Hong Kong Best award winner. As a finalist, Esther overcame the hurdles that come with being part of a competition. From trusting her instincts to managing time constraints, this competitor didn’t let anything stop her. Read more about Esther’s experience below! What was your inspiration behind your EcoChic Design collection? It all started when I saw the waste from a clothing label vendor. I took some of the unwanted clothing labels home and weaved them into a fabric. During the weaving process, I was reminded of the legend of Mulan, a woman warrior who was known for being strong on the outside but had a gentle heart. And so the concept for my collection was born. For my final collection, I used surplus textiles and discarded clothing labels, which I sourced from several garment manufacturing factories in Hong Kong. I also applied traditional hand-weaving techniques and 3D cutting technology to my work. What did it mean to you being one of the finalists for this competition? I was honored to have been one of the finalists for the competition. 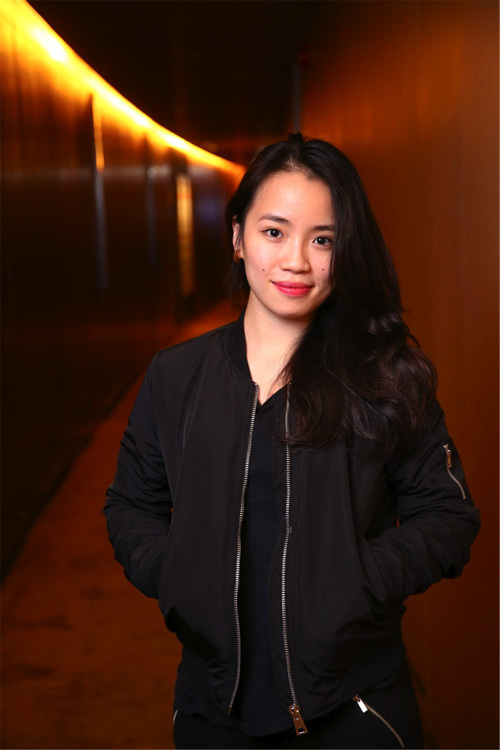 It was a great motivator for me because I wasn’t sure whether I wanted to continue in sustainable design after graduating from HKDI. At the time, I made a sustainable collection for my final graduation show but I didn’t continue after that because I thought nobody else was! At least now I know that I have the ability to continue doing so. How did you feel getting recognized for your work as the Hong Kong Best award winner? It was a little stressful! There was the pressure of not wanting to let people down as I began to gain more recognition. But I found that people are very positive towards me and very encouraging too. I feel so blessed. When you are creating a piece, what is the message you want to send to the world when they wear it? I usually spend a lot of time creating each piece of fabric. I hope people can spend time and appreciate every detail in a piece made by the designer. I think it means a lot to the designer. What was the most difficult thing you overcame in the competition? During The Redress Forum: Ford Design Challenge, I learned to trust myself and believe in my instincts. The thought of only getting three and half hours to make a piece was daunting and nothing like what I would normally do. But after completing the challenge, I actually felt sense of accomplishment! I’m usually happy with my first design sketch but I start to doubt myself, so I have to start over. Towards the end, I sometimes go back to the original design. This is why it always takes me so long to create a piece! During the challenge, I did doubt myself, but as we didn’t have enough time to start over, I had to keep telling myself “I’m good!” In the end, I was very happy with the results. Where or who do you get your inspiration from? I still remember the first time I saw a video of Dior’s Haute Couture featuring John Galliano’s designs. I was starstruck; I had found my goal in the fashion industry. If you could choose only one color to use for your future collection, what would it be and why? Red. It makes me feel passionate. The color itself is so electric. I strive to keep myself in a constant state of passion throughout life. Why is it so important for the fashion industry to become a more sustainable one? Fast fashion brands have been providing consumers with a high quantity of clothing at more affordable prices. This allows consumers to get their hands on fashionable clothing easily. I have no doubt of the economic benefits and i’m sure this also pushes designers to improve and bring forth new ideas. On the other hand, fast fashion also reels in low quality fashion and copies because the provider is always rushing against time. We’ve already seen this being a problem with few big fashion retailers. Consumers have lost focus and no longer care about the details of the clothes and the quality. Designers feel tired when they’re constantly designing and producing new clothes day in and day out without enough time to find inspiration. Recently, a few high end fashion designers have realised that this was a growing problem and have begun to change. For example Jean Paul Gaultier is now focusing solely on haute couture, as he wants to spend more time on design details and quality. I think it's good that high end designers are starting this trend, as they have the power to change the public's perspective. It might take some time to see changes, though, since fast fashion still remains a very attractive option. If you could describe your collection in three words, what would they be? Personal, introspective, transforming. To know more about Esther’s journey, watch Frontline Fashion: The EcoChic Design Award, Monday August 29 at 20:30 (UTC +8) Hong Kong.